Shavarsh Karapetyan trained his eyes on the asphalt as he rounded the corner. He had 45 pounds of sand strapped to his back, facing the final push on a 13-mile run fueled by the fury he’d been nursing ever since Soviet coaches dropped him from the national swim team. Karapetyan, after all, had captured eight European swimming titles and notched numerous world records for the USSR. And at 23 years old, he hadn’t yet reached his athletic prime. Who knows what political maneuvering had kept him off the team that competed in the world championship weeks earlier? Maybe the higher-ups in Moscow wanted to deepen their reserves of elite athletes by developing younger swimmers. Maybe they resented Karapetyan’s dominance because he was Armenian, from the fringes of the empire. Karapetyan was raised during the height of the Cold War and cherished competing for the hammer and sickle. But for now, all he could do was train and wait for an opportunity to win back his spot. So he kept running as the sun set over Armenia’s capital of Yerevan on September 16, 1976. Just as Karapetyan reached the bridge, the sound of metal smashing against concrete tore through the cool evening air. He looked toward the commotion, through the blizzard of dust that had kicked up from the hillside below, and saw a trolleybus disappear below the surface of Lake Yerevan. Its two electric trolley poles poked up from the water like antennae. If Karapetyan gave any thought to his next move, he doesn’t remember it. He sprinted down the hill, ditched the weighted backpack, stripped to his skivvies, and dove into the lake. Armenia is not a nation of swimmers. Tucked among Turkey, Iran, Azerbaijan, and Georgia, this landlocked country, with a population of 3 million and an area smaller than Maryland, spent centuries under the dominion of foreign empires before it declared independence in 1991. It has not had a maritime border since the 14th century, when the Armenian Kingdom of Cilicia controlled a swath of Mediterranean coastline in what is now Turkey before being sacked by Egyptian invaders. The country is home to just a handful of public pools, and few of Armenia’s lakes and rivers are suitable for swimming. Igor Safaryan, president of the Armenian Swimming Federation, estimates that only 30 percent of the population knows how to swim — a figure he says has changed little since Soviet times. “And I’m not counting the elderly or young children,” he said. Like neighboring highland peoples of the Caucasus Mountains, Armenians traditionally excel in rugged sports like wrestling, weightlifting, and boxing. But during a brief window in the 1970s, the republic became an unlikely source of dozens of gold medals for the Soviet Union in finswimming, a niche sport in which competitors propel themselves forward using rubber fins strapped to their feet. 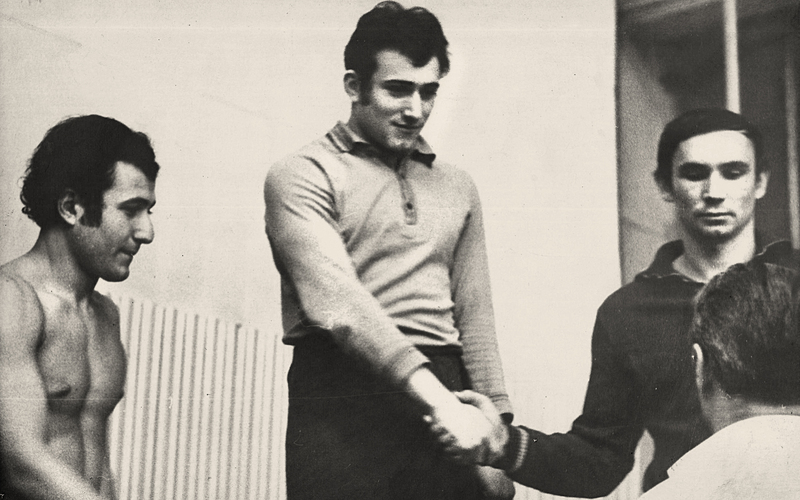 And the most prolific Soviet finswimmer of this era was Shavarsh Karapetyan. Karapetyan was raised in a one-story house in Kirovakan, a northern Armenian city now called Vanadzor, where his father, Vladimir, was determined to make athletes out of Shavarsh and his younger brothers Kamo and Anatoly. When the family moved to Yerevan in 1966, Vladimir enrolled Shavarsh in a gymnastics academy run by former Olympian Albert Azaryan. Karapetyan impressed the gymnastics coaches with his commanding build, quick reflexes, and relentless ambition, but they said he had started too late to become a champion. One coach suggested Karapetyan take up swimming. The sport clicked for him, and over the next several years he excelled in the backstroke and freestyle events as a top junior prospect in Armenia. But Karapetyan hit his ceiling in classical swimming as well. “He had a lot of deficiencies in his technique, and he didn’t have the required flexibility,” said Safaryan, who coached top Armenian swimmers at the time. When Karapetyan was dropped from the Armenian select team at age 17, he was crushed. Large air bubbles were rising from below and bursting at the surface. The passengers can breathe down there, Karapetyan thought, but not for long. He contemplated his next move as he treaded water 80 feet from the shore. Karapetyan’s brother Kamo had also been running by the lake when the trolleybus crashed into the water. An accomplished swimmer himself, Kamo dove in after his brother and joined him above the sunken vehicle. 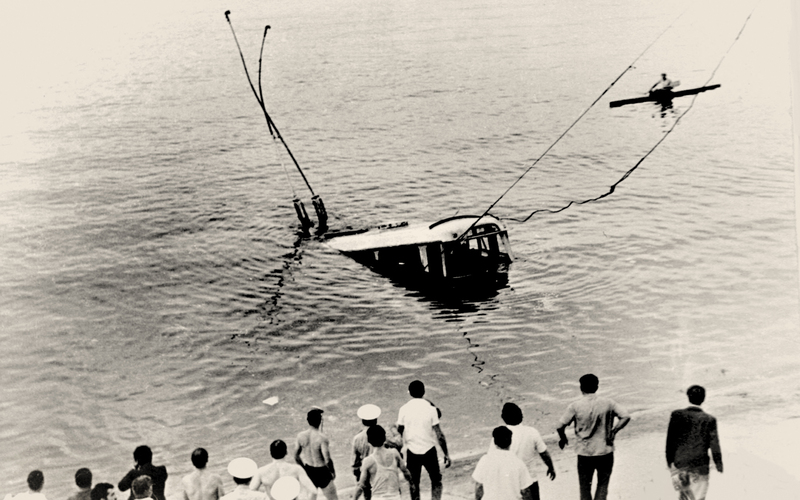 Using the trolley poles as guideposts, they descended 15 feet underwater to explore the position of the bus, whose bumper was buried in the lake bed. They circled the vehicle, searching for an open door or window that could serve as an escape hatch, but came up empty. Shavarsh decided he would have to break a window. Shavarsh had followed the bus into the water almost on instinct, but he considered his own fate as he prepared to dive. He instructed Kamo to stay on the surface not only to retrieve the passengers that Shavarsh planned to haul up, but also in case he needed to be rescued himself. Shavarsh dove and located the back window of the trolleybus. He brought his legs to his chest and thrust his left leg through the window with what he described to me as a “karate kick.” Shards of glass shredded his leg when he pulled it back through the opening, but the cold water helped stem the bleeding. His kick had dislodged the 6-foot-wide window from the rubber lining that held it in place. When he gripped the jagged edges and pulled, the window came out completely. A hurricane of silt from the lake bed made it almost impossible to see inside the bus. He tossed the windowpane to the side and groped around for anything that felt human. The day that 17-year-old Shavarsh Karapetyan was informed he had no future as a classical swimmer, he met a hard-drinking lifeguard named Liparit Almasakyan. Although neither of them knew it at the time, their association would determine the fate of Karapetyan and dozens of others on that September evening in 1976. Known to friends as “Lipo,” Almasakyan helped pioneer Armenia’s underwater sports program, including finswimming. Karapetyan knew Lipo from swimming circles, and the two went to a nearby watering hole to pound beer and vodka while Karapetyan lamented the abrupt end of his athletic career. Lipo had been recruiting athletes for a finswimming team, and he told Karapetyan he’d like to train him. They began later that day. “I took a taxi home, rested up a bit, and came back for my first workout,” Karapetyan recalled. Much of the training took place out of water, colossal strength work that became legendary in Armenian sports circles. He would run 12 to 18 miles a day, often loaded down with a sand-filled backpack. There were rowing workouts on manmade Lake Yerevan, which was forged a decade earlier and had already become so inundated with industrial runoff that only the drunk or the indifferent dared swim in it. Lipo also concocted experimental exercises for his pupil: He affixed planks of wood to cross-country ski boots and made Karapetyan jog in them to improve his foot strength. Karapetyan would carry a fellow swimmer on his shoulders while running hills along the shore of Lake Yerevan, or he’d climb those same hills on his hands while a teammate held his legs, wheelbarrow-style. Finswimmers race underwater using either snorkels or scuba tanks for longer distances; for shorter events they simply hold their breath. Lipo got his start in subaquatic sports by training himself to hold his breath for minutes — until survival instincts kicked in — and he taught his athletes to do the same. The key was to intentionally hyperventilate with five deep breaths. That would blunt the sensation of needing to breathe by reducing the amount of carbon dioxide in the blood, thus allowing them to remain underwater for longer periods of time. In the three European championships from 1972 to 1975, Karpetyan obliterated a bevy of world records and grabbed eight gold medals. Then, in 1976, just when Karapetyan was preparing to continue his reign at the inaugural finswimming world championship, he was dropped from the team. He had fallen ill a few months earlier but had fully recovered, and he believes Soviet sports officials wanted to feature other athletes at the worldwide meet. Karapetyan was only 23 years old; he had a lot of gold left to win. On the day of the crash, Shavarsh Karapetyan was ratcheting up his workouts to show those sports federation bastards the grave error they’d committed. Some 90 passengers were onboard the no. 15 trolleybus when it rumbled onto the bridge during the evening rush hour: factory workers, schoolchildren, university students, housewives, pensioners. Many were knocked unconscious when the bus veered sharply to the right, sailed over an embankment, and nose-dived into a stretch of concrete at the edge of Lake Yerevan before rolling into the water. Precisely what caused the accident remains unclear. An internal government report faulted the driver for speeding. But witnesses said later that the driver had refused to stop the bus to let a pickpocket escape. According to those witnesses, the thief then clocked him over the head with a metal bar and caused the driver to lose control of the vehicle. Karapetyan had already dragged one or two passengers to safety when he grabbed Avetisyan. He had established a rhythm for his rescue mission: After snatching a passenger, he would swim to the top of the trolleybus, plant his feet on the roof, and rocket to the surface. There he would hand his human cargo off to Kamo, who would carry the passenger to kayaks and rescue boats that had arrived on the scene. Then, Shavarsh would dive again. News of the accident spread quickly through the city. The brothers’ father, Vladimir, was at work less than two miles away when someone pulled up in a car and informed him that a trolleybus had fallen into Lake Yerevan. Vladimir knew that Shavarsh and Kamo were training near the reservoir, and he feared they had taken the bus home. “I thought to myself, It’s a good thing I made sure they learned to swim,” Vladimir said in a recent interview with Grantland. He jumped into his car and sped to the scene, where hundreds of people had gathered behind a police cordon to watch the tragedy unfold. When Vladimir reached the edge of the bridge, he saw Shavarsh rising to the surface to pass the drowning passengers to Kamo. On the concrete dam, medics revived passengers who were brought to shore by the kayaks, and officials from the city prosecutor’s office questioned witnesses. At the edge of the lake, the screams of a middle-aged woman whom Karapetyan had pulled out of the trolleybus drifted over the water. Her 20-year-old daughter remained trapped, and medics restrained her as she tried to jump in and retrieve her child. The daughter would not survive. Shavarsh continued to dive. There was no time to determine whether passengers were alive or dead as he pulled them from the trolleybus. And at some point near the middle of the operation, he made a mistake that haunts him to this day. Shavarsh’s years as an elite underwater swimmer had soldered his hyperventilation technique to his brain. After lifting each passenger, the routine kicked in like clockwork: five deep breaths, then back down. But then, in the rush to save as many lives as possible, Shavarsh betrayed his training. One time, when he surfaced and sensed he was running out of time, Shavarsh took one deep breath — not five — and proceeded to descend. As he fished around inside the trolleybus, the urge to breathe became unbearable. Shavarsh grabbed the first object that drifted by and bolted back to the surface. Kamo was perplexed when he saw his brother emerge with a large, rectangular padded bus seat in his clutches. Shavarsh had mistaken it for a passenger. Shavarsh Karapetyan’s rescue mission had lasted longer than 20 minutes when emergency workers told him to stop diving. Anyone else left inside the bus would already be dead. “They said, ‘Don’t kill yourself for nothing,’” Karapetyan recalled. The brothers estimate he dragged 30 to 35 passengers out of the water, several of whom were no longer alive by the time they were placed in the boats. But Karapetyan’s work wasn’t done yet. Two cranes arrived at the scene to lift the trolleybus from the lake. A police official instructed Shavarsh and Kamo to fasten the cranes’ cables to the trolley poles so the bus could be dragged from the lake. On Shavarsh’s first attempt, the cables wouldn’t stay attached to the poles, so he took a crowbar from one of the rescue boats and dove again. He smashed one of the vehicle’s side windows and then swam to the opposite side and shattered another. After several more dives, Shavarsh had threaded the cables through the broken windows. When he surfaced for the last time, he passed the cables to Kamo, who took them to shore in a motorboat and handed them to the authorities. As the crane operators hoisted the trolleybus from the lake, water drained from the windows and bystanders were able to see inside, where more than 40 bodies were scattered across the floor and seats. Less than 45 minutes after crashing into the water, the bus was back on dry ground. According to a classified report by the Armenian Communist Party, which the Yerevan news agency Mediamax obtained from Soviet-era archives and provided to Grantland, 46 people died while 20 others were saved and received medical attention. Shavarsh and Kamo both insist they saved more than 20, but that a number of passengers simply left the scene after being brought ashore. Several more had managed to escape before the vehicle reached the bottom of the lake. As Shavarsh, finally onshore, watched the cranes haul the trolleybus from the water, his legs began to wobble. “It felt as if I was losing consciousness,” he told me. His father took off his own shirt and wrapped it around the gashes on Shavarsh’s lower left leg. “There’s nothing left for you to do here,” Vladimir told his son. Shavarsh’s temperature spiked after he returned home that evening. His body had been ravaged by the prolonged exposure to Lake Yerevan’s cold, polluted water, and his family said he was mumbling incoherently. “He was delirious,” Kamo recalled. A physician and family friend named Edouard Nazaretyan visited the Karapetyans’ apartment the next day to examine Shavarsh. The doctor found him with a 104-degree fever, muttering to himself, and suffering from convulsions. Nazaretyan diagnosed him with pneumonia in both lungs, a condition exacerbated by the contaminated water of Lake Yerevan. Shavarsh was brought to the hospital, where doctors pumped him full of antibiotics. After about three weeks in bed, he managed to walk on his own. Shavarsh Karapetyan (center) shakes hands with a rival on the podium after a finswimming competition. His brother Kamo stands on the left. Three weeks after Karapetyan got out of the hospital, he was back in the pool. But he found that he wasn’t the athlete he used to be — his respiratory system had suffered irreversible damage from his time in the toxic lake and the resulting pneumonia. He also encountered a new psychological barrier. “It wasn’t that I was scared of the water,” he said. “I just hated it.” Karapetyan, however, persisted through his newfound handicaps. He forced himself to run and swim as he choked on the mucus that seeped up from his lungs. Day after day, for several months, he lowered himself into the pool with all the joy of a man jumping into a tank filled with piranhas. “I had never raced so angry before,” Karapetyan told me. His lungs burned as he worked the monofin with his legs, his arms extended in front of him as he grasped the scuba tank. Kamo paced on the deck of the pool, watching for signs that his brother’s body might give out on him. When Shavarsh touched the wall far ahead of everyone, Kamo saw that his brother was too weak to make it out of the pool by himself. He jumped into the water and unfurled a fraternal bear hug. Shavarsh Karapetyan’s time — 3:06.2 — was his 11th and final world record. Later that year, Karapetyan captured three silver medals and a gold at the European championship in Hungary. It was a remarkable return to the pinnacle of his sport less than a year after he nearly killed himself trying to pull survivors from the sunken trolleybus. Karapetyan’s opponents in the years after the bus crash had no idea of the trauma that half-hour in Lake Yerevan had wrought on his body and mind. In fact, outside of a handful of people — witnesses, government officials, and Karapetyan’s friends and family — hardly anyone in Armenia or the rest of the Soviet Union knew of his heroics. That’s because Soviet authorities hushed up the accident. “Their ideological rationale was that a Soviet trolleybus could not fall in the water,” explained Pushkin Serobyan, a former Armenian sports official who worked for the Yerevan city prosecutor’s office at the time of the accident. This was not unusual. Soviet authorities were loath to publicize news of nuclear accidents, plane crashes, terrorist attacks — anything that might alarm the public or reveal weaknesses in the communist state. The public was shielded either completely from such events or offered the barest of details in remote corners of state-run newspapers. The classified government report on the accident makes no mention of Karapetyan’s name. Two days after the tragedy, the official newspaper of the central committee in Armenia, Kommunist, published three small items informing readers that there had been a fatal trolleybus accident and expressing condolences. Together, the notices totaled fewer than 100 words. Six years after the accident, the Soviet public learned of Karapetyan’s deed thanks to an article Sergei Leskov published in the Soviet newspaper Komsomolskaya Pravda. Leskov had learned of the tragedy from one of Karapetyan’s coaches while covering a finswimming competition in Moscow, and his editor immediately dispatched him to Yerevan to unearth the story. It’s unclear why local authorities decided to hand over documents about the accident to Leskov after keeping quiet for so long. Perhaps they feared repercussions from Moscow if they stonewalled a leading national newspaper’s attempt to publish an ideologically sound lionization of a Soviet athlete. The article ran October 12, 1982, under the headline, “A Champion’s Underwater Battle.” It masked the tragic aspect of the story: Readers were told that Karapetyan rescued 20 people, but there was no mention of the fatalities. The following year, Literaturnaya Gazeta, arguably the most prestigious newspaper in the Soviet Union, published a full-page article by Gennady Bocharov about Karapetyan’s heroism. A month later, the Soviet government awarded Karapetyan the Order of the Badge of Honor, a civil award far lower on the prestige ladder than the highest Soviet honorary title, Hero of the Soviet Union. Afterward, Bocharov spent decades lobbying officials in Moscow — without success — to formally confer hero status on Karapetyan. 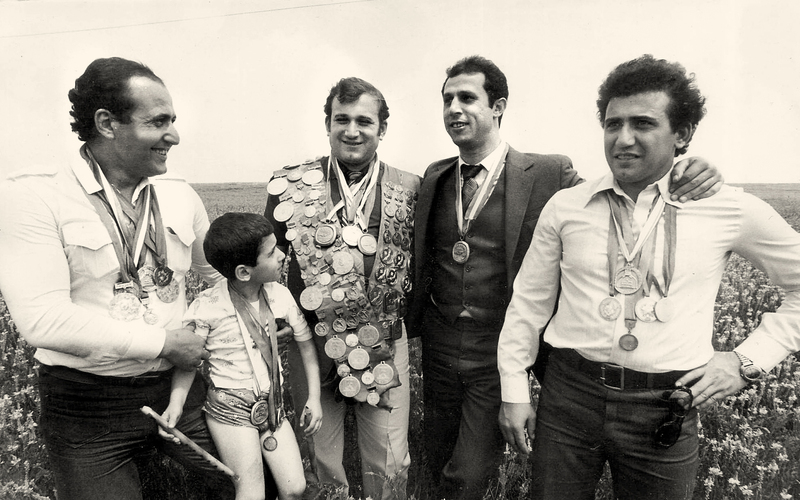 Shavarsh Karapetyan (third from left) and his brothers Anatoly (far right) and Kamo (far left) decked out in their finswimming medals while posing with a friend and Kamo’s son, Karo. Karapetyan remains a legend throughout the former Soviet Union, so it made sense when organizers of the 2014 Winter Games in Sochi tapped him to carry the Olympic torch into the Kremlin. Karapetyan’s leg of the relay last October might have gone largely unnoticed by global media if not for a fickle torch and his quick thinking in front of the cameras. After jogging through the Kremlin gates, a white ski outfit hugging his round frame, Karapetyan glanced at the torch and saw that the Olympic flame had gone out. He quickly grabbed the attention of a plainclothes security guard and presented the torch for the guard to rekindle with something resembling a Zippo lighter. Karapetyan resumed his jog, apparently unfazed by the mishap, and waved joyously at onlookers as he trotted along. The Olympic flame died numerous times during the Sochi torch relay, but the image of Karapetyan bumming a light for the torch became a symbol of the logistical problems encountered by the Russian hosts, who spent a reported $51 billion to stage the Games amid allegations of rampant corruption. After moving to Moscow, Karapetyan opened a shoe-repair shop in a storefront provided by a local benefactor and sports enthusiast. (Armenians may not be swimmers, but they are renowned across the former Soviet Union as skilled cobblers.) His business continued to grow, and he now owns restaurants and shops selling clothes and groceries. The decades have eroded the vibrant face and dark Armenian locks of the 23-year-old who fearlessly plunged into Lake Yerevan almost 40 years ago. A paunch now accentuates his once powerful frame, and he wheezes and coughs occasionally in conversation — a respiratory leitmotif signaling the trauma his lungs have endured. In February, I met Kamo, Shavarsh’s brother, in Yerevan, at the spot on the bridge where the trolleybus flew over the embankment. It was a bright winter morning, and he had agreed to show me where the tragedy had occurred. The no. 15 route still runs along the bridge, and the trolleys carrying midmorning passengers rolled by in roughly 10-minute intervals. He pointed to the area near the dam where the bus careered off the road and sank to the bottom of Lake Yerevan. “It’s the deepest part,” Kamo said. We gazed out over the water, where empty bags of chips and other debris lay trapped in patches of thin ice. A fog had descended into the valley, obscuring the view of Mount Ararat behind us. The scene reminded me of a well-known Armenian fable. It tells of twin brothers who arrive at a lake in search of a mythical, fiery horse that lives beneath the surface. One brother dives in, discovers he can walk and breathe underwater as if on land, and proceeds to tame the beast. His twin remains onshore, too afraid to follow his brother into the abyss. Carl Schreck (@CarlSchreck) is a senior correspondent with Radio Free Europe/Radio Liberty in Washington, D.C. He has written for Sports Illustrated, Details, The Nation, and Foreign Policy, among other publications.